Rio once more, two days here this time and then leaving on early Wednesday morning for more familiar grounds in California. It feels good to get out from south America. Now that sounds like it has been horrible here, which it really hasn't, but especially brazil has been a bit annoying in the fact that I don't get what people say and people don't get me, meaning that striking up a conversation feels like trying to play ping pong in the dark. Every time someone hits the ball, the other person totally misses it and have to try and find it. Surviving isn't all that hard, hand signals, pointing at what you want, signaling amount with fingers and a few Spanish words gets you a long way, but just talking to people is always a chore. So for that reason, the states is going to be a blessing. That being said, I should spend a year, or at the very least a couple of months in a Spanish speaking country just to get the language in properly. Anyways, today I had planned for a favela tour, where you have a local from that particular favela (shantytown) taking you around and telling you about the history, the social structure and the everyday life in a comunidae. There are a ton of different tours inside favelas, but the majority felt more like dramatizations and sensationalism than any real description of the real favela. Then one I planned for seemed like the most serious option in the bunch. Of course I overslept and then couldn't find the right bus and so on and so forth. End result: no tour. The bright side of it all, though, was that I accidentally stumbled into a really cool produce market where street vendors were pawning of just about any fruit you can think of, whatever meat cut your heart desires and more types of fish than I could name with a freaking encyclopedia in my hands. The best thing: seeing as they were quite keen to sell, any time you looked for more than 0.2 seconds at a fruit stall they handed you a strawberry. And as soon as you were sampling, the user the time you took to swallow to cut up another fruit and hand you a piece. I had absolutely no idea what 70 % of all the fruits I tried there were called, but they were good, some of them really good. Also, seeing as how my daily intake of vitamin-c pretty much puts me in the risk zone for scurvy I figured some fresh fruit can't really hurt that much. This is one of the situations where speaking Portuguese could have saved me a lot of money, but hey, it tasted just as good anyways. The redeemer I would prefer to do in the early morning when there's not that many people there, and hang gliding... Well, for 300 reais, I can either live for about a week and spend 15 minutes in the air. So as much as I would love to admire Rio from the air, it would not only be fiscally irresponsible, but also mentally retarded considering my remaining budget. So what remains is Sugarloaf mountain, which is just (!) 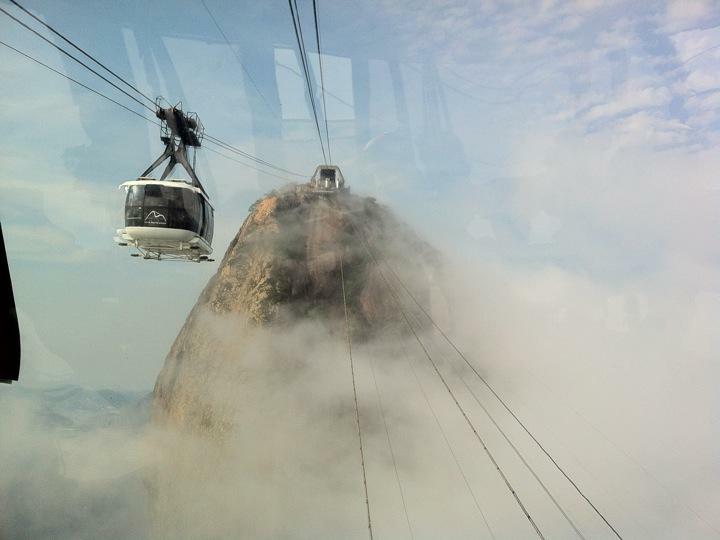 53 reais, or about 200 SEK for just the cable car up there. You know, the one where Bond was fighting jaws in moonraker. But it was kinda beautiful from up there, even though it was a bit cloudy so you could never see the entire town at once but had to wait for a gap in the clouds. I also saw definitely the most amazing sandcastles ever along Copacabana beach walk. Ungodly insane they were, I tell you. Going back tomorrow after the redeemer to snap a few picture and utilize the free gym equipement they have along the same walk. That's right, they have got pull-up bar, dumbells and a varied assortment of cheap gym equipement spread out in stations along the beach, free to use. AWESOME.